No one can say for certain how the first weeks of Smurf's life played out, but his broken body and frightened eyes hint at abuses unimaginable. 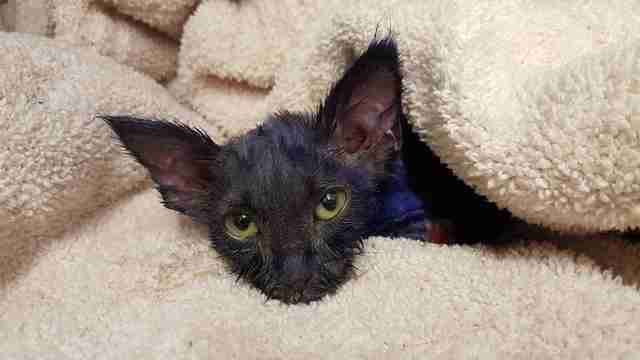 The sweet but scared kitten, thought to be less than 2 months old, was dropped off at a San Jose animal shelter in California this week. While it was obvious that someone had dyed his fur a deep shade of purple, staff soon discovered his body was covered in deep bite marks and abrasions. 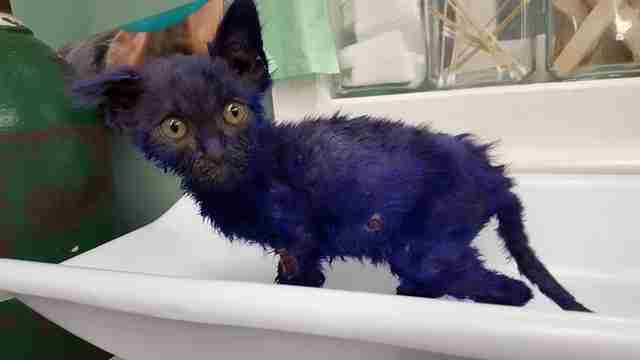 Rather than euthanizing Smurf, the shelter alerted the Nine Lives Foundation, a rescue center for injured and abused cats run by veterinarian Monica Rudiger. For her, the young animal's injuries were consistent with a shocking but little-known practice - people using kittens as live bait for dogs being trained to fight. "I don't know what happened to him, but my best guess is that he was used as a chew toy. 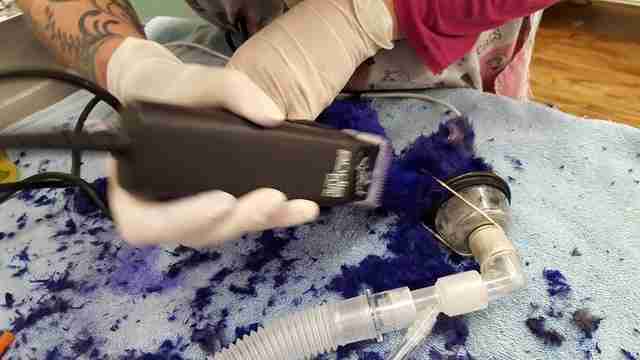 We have a cat with multiple puncture wounds and abrasions," Rudiger told The Dodo. "He can't tell us what happened to him, but I've seen this before. I've seen kittens be used as bait and chew toys for other animals. It makes sense to me." 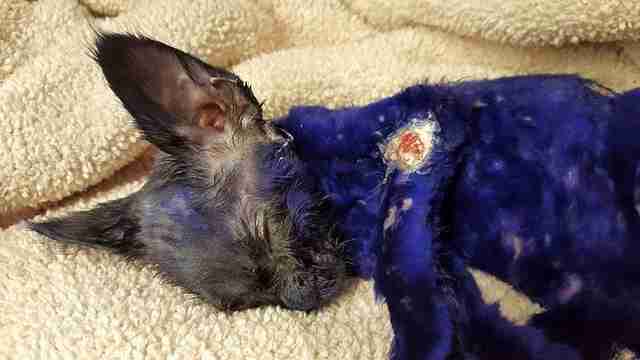 A shaving of his purple fur revealed more injuries, including a painful gash on his shoulder - all pointing to this manner of abuse. Rudiger says that the use of kittens like Smurf for training in dog-fighting operations isn't so uncommon, though it is often preventable. "In our area, cats are used as bait for pit bulls every day. It's just horrifying," she said. "That's why you don't offer free kittens out on the internet - they use them for whatever they want. Who knows what Smurf's story was? I wonder about all the other kitties we don't get to save." Whatever the truth is behind Smurf's sad history, someone saw fit to place him in the hands of people who care. It's too soon to tell how fully he'll recover, but he will likely always bear the mark of abuse. 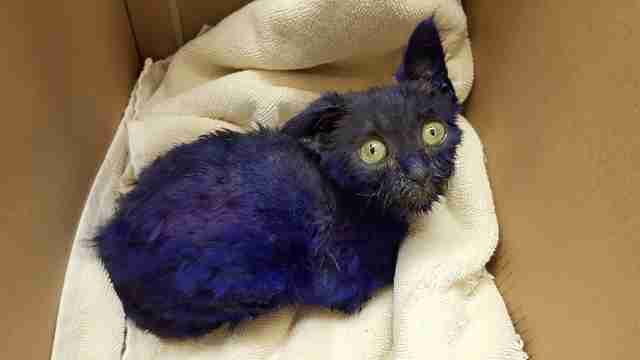 "We'll never get that purple dye out of him. He's been shaved and he's still purple. It's so deep; It's probably undiluted garment dye," said Rudiger. "I hope it ends well for him, but he seems to be doing really well." As word has spread about Smurf's rescue, dozens of people have come forward expressing interest in adopting him, but it will likely be months before he is well enough to become someone's companion. There are, however, countless other cats available at shelters who would be thrilled to be extended that offer, too. The Nine Lives Foundation relies on the public's help to save the lives of animals, so consider making a donation to their cause. You can also keep updated on Smurf's progress by following the Nine Lives Foundation's Facebook page. Finally, click here to support tougher laws against dogfighting.